Now, Skater has done it again. The new 478 we have watched for the past 8 months is getting to a point where they have decided to allow the secret new build out. 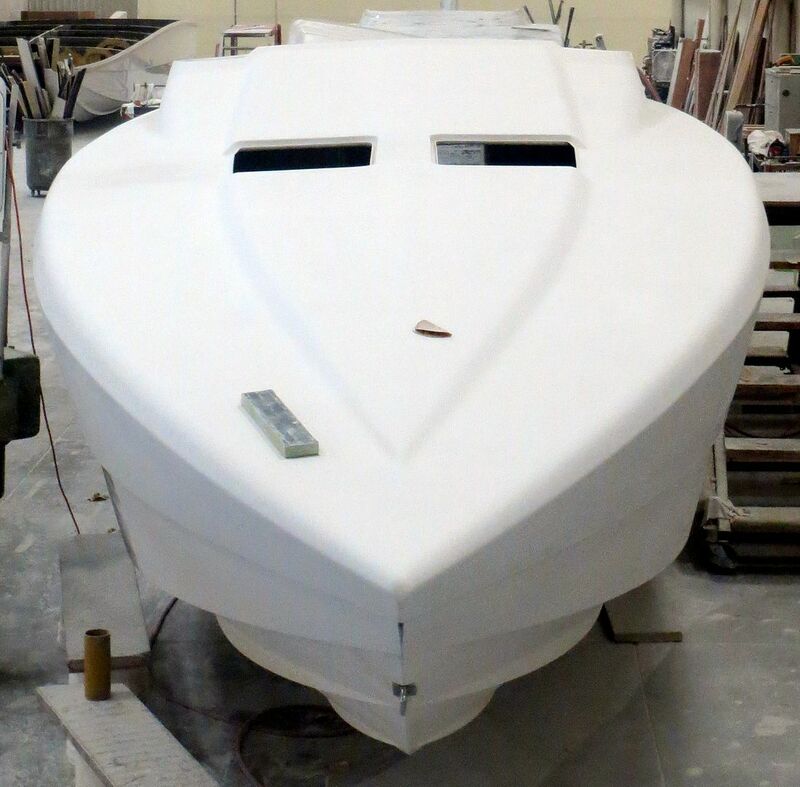 The lines on this boat are something that we cannot wait to see on the water. In our humble opinion, they are superb. We will put up a few of the photos of the build, and add more as the boat continues on its road to completion. If allowed, we will put up some of the main steps in the build from start to finish after the new owners take delivery of this latest Skater masterpiece. As the model number of 478 implies, this boat is over 47' long, with a 9' beam. The raised deck makes the boat extremely deep, but as you can see, the sleekness of the design says "speed" even when it is just sitting while being built. Stay tuned as this raised deck 478 continues on its way to completion. One of the things many have attempted in boat building is the raised deck offshore performance cruiser. Flat decks don't have the cabin room the ladies like. Raised decks often lose their sleek performance lines. Designing and building one, without the look of a pregnant frog, has always been elusive. The Black Thunder 43, the Sunsation 43, the Outerlimits 41, and a few others have succeeded. This Skater 478 may be the sleekest to date. Now for the last important question, will the performance match the lines? The history of Skater says absolutely. This particular boat will be receiving Mercury Racing 1100's with #6 drives, so the all around combination of performance and reliability should be exactly what the doctor ordered. We can't wait to find out. Great looking boat, nice clean lines. any idea what the wetted surface length is? 40-41'? Not sure, the transom to bow tip length is almost 44'.